Being part of The Access Project has opened doors to many opportunities that I never would have imagined. One of those is having the chance to speak at a round table event with The Access Project, to Sir Jonathan Phillips of Keble College, Oxford. A group of students on The Access Project and I were invited to speak about our aspirations and access to higher education. It was both refreshing and reassuring to meet other like-minded students, hearing their goals to apply to highly selective universities such as Oxford, Cambridge and even Harvard! 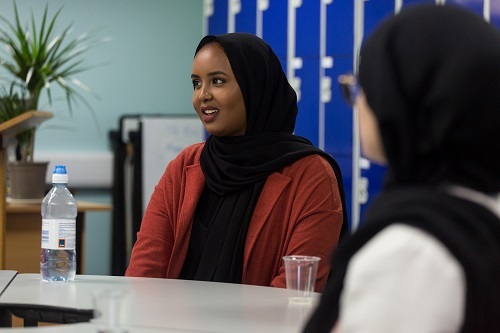 My name is Sundus, I’m a Year 13 pupil who has been on The Access Project for over a year. After hearing a University Access Officer speak at a Sixth Form assembly in my school, I wanted to know more about this wonderful opportunity. It amazed me that a programme like this existed and guidance from a specialist in my subject was something I always longed for. After visiting the charity’s website, I decided the best thing for me to do was to apply. I knew from older students about the difficulties of studying A Levels and thought about how lucky my school was to be enrolled in such a supportive programme, especially as areas like the one I live in are often overlooked. The sixth form I attend has not had many pupils aiming to apply to the best universities, so I’m really pleased we have The Access Project! I was first tutored in English Language and Literature. I had a tutor with a degree in English Literature who helped me through my Year 12 summer exams. Our first tutorial set the tone for the ones to come; that she would always make sure I was comfortable with the workload. My Psychology tutor for Year 13, similarly, ensures that I update her on anything I don’t understand, and even correcting her if she makes mistakes, which rarely happens. I am now also a Student Ambassador for The Access Project. Now in my final year of my compulsory education, I’m more grateful than ever to be part of programme. Writing a personal statement while juggling the responsibilities that come with Year 13 has been demanding, but my University Access Officer Rachel Holmes has helped make the process seem less worrying. My mentoring sessions have been therapeutic, as I can express my worries or aspirations freely, trusting that she will do what she can to ensure that my education and application are of the best standard. For example, she helped to make sure my personal statement had the same passion as I expressed in person, which is vital for universities to read my enthusiasm without meeting me. The Access Project, Colmers School and Keble College partnership is a rare and special opportunity that will allow pupils from disadvantaged backgrounds to realise their full potential. This partnership is inspiring to me because it means other students, like me, have more access and links to a selective and prestigious university like Oxford. I hope that having a direct link to Keble College will boost prospective students’ confidence when applying.